Another year’s gone by, and once again I appreciate that you’ve been really great at not giving me what I don’t want for Christmas. Naturally, there are some more things I would like to not find under my tree this year. Leading the 2018 list is the Intech Golf #2 Poop Emoji Mallet Putter, offered for $32.99 at offpricegolf.com. The ad copy says it is “sure to get a laugh every time you use it,” but I really don’t think that is true – at any time. 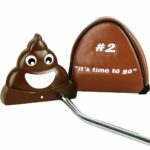 To make things worse, this brown pile of poo putter comes with a matching “#2” headcover embroidered with the phrase “its time to go”. Just seeing this thing for sale has got me down in the dumps, as it were. 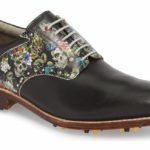 I was also pretty skeeved out by the Robert Graham Leather Oxford golf shoes with removable cleats, on sale at Nordstrom.com for a blistering $299.90 a pair. Looking down at my shoes and seeing those skulls in the floral pattern will not do great things for my golf game. I think they meant to say “minimal taste”. I’m still trying to lose some weight, so please make sure I don’t receive a dozen golf-themed chocolate covered Oreo cookies, sold on Etsy.com for $24.00. 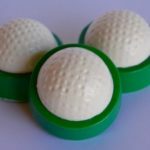 Just seeing these half-golf balls on top of Oreos covered in green icing should help keep my appetite down – but better safe than sorry, I always say. Sometimes the ad copy for Christmas golf gifts says more than what might have been intended. 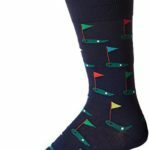 That’s what crossed my mind when I saw the golf-themed Hot Sox Men’s Crew Socks, sold for $11.37 at Amazon.com. With all due respect, that’s a very low threshold. I love to play golf, but that doesn’t mean I would enjoy Mini Indoor Golf, with the little man at the end of a golf club taking a swing at tiny golf balls on my living room floor. Sold at Amazon for $59.99, I give the game developers credit. 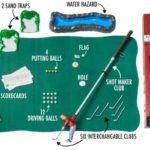 They created a miniature version of the real thing, with interchangeable clubs, “sand” traps, and even a “water hazard”. Even so, nothing about this game holds any appeal for me, although others might be fine with it. One reason I play golf is that I’m not good at other games, including but not limited to basketball. That’s probably why I have no interest in the Hot Shot Putting Cup, sold at golfgifts.com for $19.99 SRP. 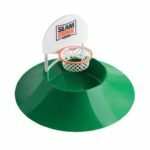 This device features a backboard and hoop set just above the hole, with the balls running up a sharp ramp to make the “shots”. Not only am I sure I would I miss nearly every attempt, the effort involved would probably mess up my normal putting routine. 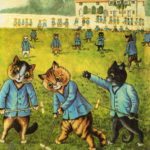 I already have a few pieces of golf-related art in my office, so I really don’t need a Louis Wain Print showing cats playing my favorite game. These prints are available at Etsy.com for $9.00, so at least the seller is not trying to gouge cat-loving duffers. On the other hand, I remain un-charmed by the depiction of blue-coated cats putting with what look to be croquet mallets. There are limits to the amount of whimsy I can stand at any one time. When I cover the LPGA Tour, I often see some cute or funny headcovers used by the players to add a smile to the challenges they face during their tournaments. 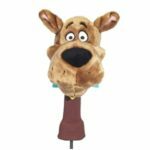 However, if it’s all the same to you, I would not like to have the Scooby Doo headcover on my driver. Sold at Dicks Sporting Goods for $29.99 SRP, the cover looks like a pretty faithful recreation of the none-too-bright cartoon dog. I appreciate the effort, but it’s just not for me. Thanks again for the opportunity to tell you what I don’t want for Christmas. Have a great holiday, and please say hello to Mrs. Clause and the elves.